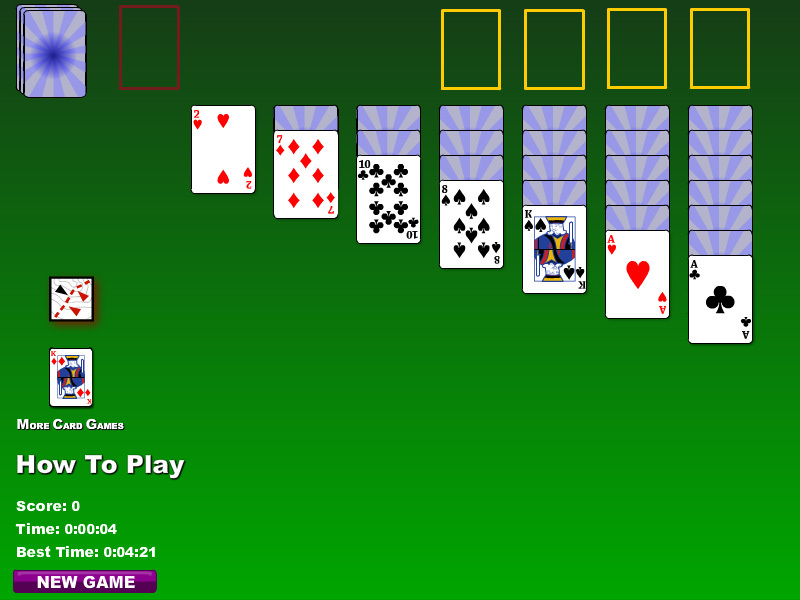 Klondike Solitaire is a popular solitaire card game played with a single deck of 52 cards. In Klondike Solitaire, the player attempts to sort the cards by suit and in order into four piles of cards known as foundations. To start out, 28 cards are dealt into 7 columns, the first column having one card, the second having two cards, continuing this way up to the 7th column which has seven cards. Only the top card in each column is turned face up, all other cards are face down. Cards can be moved between the columns in groups, or to the foundations one at a time. The cards in the columns must be built down (from King to Ace) alternating color. When the player gets stuck he can click on the deck in the top left of the game screen. This will deal 3 cards at a time onto the waste pile. The player may move the top card from the waste pile into the columns or to the foundations to continue. When the deck is out of cards, the player may reset the deck and continue.